In 1457 BC, a coalition of rulers from upper Canaan and western Syria, led by the King of Kadesh, rose in revolt against Egyptian rule, gathering a large army near the city of Megiddo. The young Pharaoh Thutmose III (aka Tuthmosis) raised an army and marched to the Levant to meet them. Given a choice of three routes north to the Jezreel Valley, Thutmose chose the centremost, the narrow and treacherous pass of Aruna, against the advice of his generals, and so surprised the Canaanites, who had deployed their infantry wings to block the easier southern and northern roads and left only their chariots to guard the city. The following morning, after Kadesh had hastily inverted his infantry wings to face the threat, Thutmose deployed his army in a crescent of three wings and personally led the Egyptian attack from the centre, routing the entire Canaanite army. The inhabitants of Megiddo, too fearful to open their gates, hauled the survivors of their fleeing army over the walls on ropes. An immediate capture of Megiddo was thwarted by the greed of the Egyptian soldiers, who stopped to loot the bodies and camps of the enemy. Thutmose besieged the city, which capitulated seven months later, and all the rebellious kings submitted to Egyptian rule. Over sixteen more campaigns, Thutmose III, “the Napoleon of Egypt”, became Egypt’s greatest warrior pharaoh, and established her largest empire. Megiddo - The walls of Megiddo are impassable terrain (use rampart tiles). Rout - After losing their 4th victory banner, all Canaan units must retreat one extra hex for each successful flag rolled against them in combat. 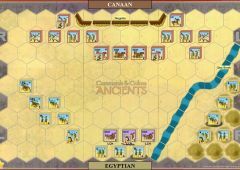 Looting - Once the Egyptians have won 8 or more victory banners and as long as they have more victory banners than the enemy, no Egyptian unit may Momentum Advance. Any unit with Thutmose attached is exempt from this rule . The Qina Brook is fordable. Units battling into or out of its hexes do not reduce their normal dice rolled in combat. 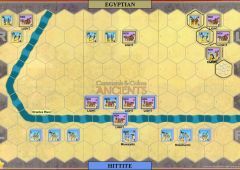 For Egyptian Light Chariots, use Light Barbarian Chariots blocks from Expansion 2 or, if these are unavailable, Persian Light Cavalry or Light Bow Cavalry Blocks with Special Unit blocks to differentiate them. 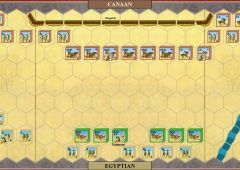 For additional Canaan Heavy Chariots, use Carthaginian Heavy Cavalry blocks with Special Unit blocks to differentiate them. Although they appeared in the 1st and 2nd Editions of the base game, the rules for Light Chariots were not included in 3rd Edition and so are detailed here for players without access to them.